Oh no! I am not referring to my son but to my friend’s son. My office mate and a friend as well told me that her son wanted her to buy him a tablet as her birthday gift for him this month of December. She was so shocked that her son was only 6 years old and yet he asked for gadgets as if he’s that old enough. Actually her son was just influenced by his teacher because tablet is what they’re using in school. Guess what? 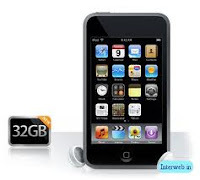 Her cyber son even asked his dad about his request and that his wish will be granted so soon because his dad will be giving him not just a tablet but an ipod touch 32g as well for his mom.